Please enjoy this podcast interview as I explain my journey of discovery, my coaching techniques and my story of creating a full-immersion coaching experience for women leaders, Retreat to Tuscany! Hi, I’m Theresa. If you are checking out my site for the first time, Welcome! I look forward to learning more about you and your team to determine if we are a good “fit” for each other. I am a passionate and energetic entrepreneur, a dreamer and a change-maker, and I love working with small business owners and team leaders who are equally passionate about leadership and developing others. If you own a small business and have employees, or are in a leadership role within your organization, I believe your #1 responsibility and privilege is developing your people. The problem is, many of us haven’t learned or don’t know how to effectively lead, develop and inspire others, and it’s the hardest part of our jobs. Leadership can be lonely, frustrating, isolating. But you don’t have to do it alone. I do what I do because it breaks my heart to meet business owners and team leaders who struggle with the people stuff, and have lost their excitement and love of their role as the leader of their team. I want to help you make the entire process easier, and more fun. I am passionate about helping my clients improve results by aligning the people within the organization with the needs of the business, putting new systems and structures in place, and becoming more intentional and purpose-driven in all that they do. Your business and your people are counting on you to get it right! I can show you how. As your strategic partner and Executive Coach, I will work with you to achieve your goals. I will share with you everything I have learned over the past 20 years consulting leaders and teams, and teaching them how to create high-performance results. I am a no-nonsense Coach who will hold you accountable, and will count on you to do the work it takes to achieve success. And we will do it together. I believe in full transparency, being authentic, and open. I do my best work when I have the freedom to coach the entire system, the leader AND the team, so we can co-create solutions for success. I believe you deserve to love your career and enjoy your business, and live the life you dream of. This isn’t a dress rehearsal, this is your one precious life. Let’s get you back in the driver’s seat so you can have fun in your business, improve results and help your people build amazing careers. I don’t believe coaching and consulting should be separate. At times I will consult, be directive, and share my expertise. And sometimes my role will be to simply hold space for you to do the work you need to do, through encouragement and support. I hold you creative, resourceful and whole, and I trust that you will take me where you and your business need to go. This is systems work, it’s a true partnership, and it is a powerful process. I am honored to do the work that I do, and I look forward to helping you be the leader you desire to be, in life and at work. 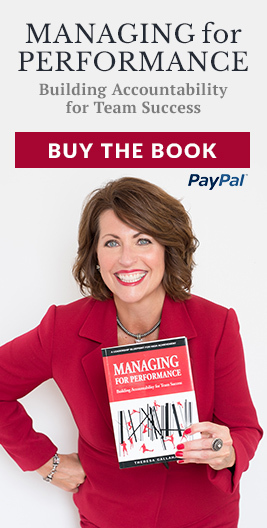 Whether you decide to apply for my Managing for Performance Executive Leadership Program, hire me as your Keynote Speaker at the next company event, or allow me the privilege of leading a Customized Workshop for your group, I will provide you with content-rich material that will inspire you to make powerful shifts, personally and professionally. 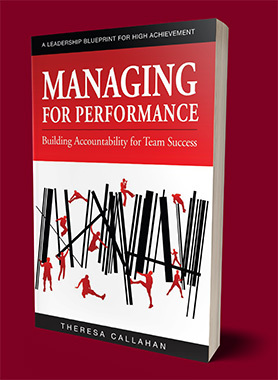 As a Kolbe Certified Consultant, I use the Kolbe Concepts in all of my Leadership and Team-building programs, and I teach the content that was published in my book, Managing For Performance; Building Accountability for Team Success. 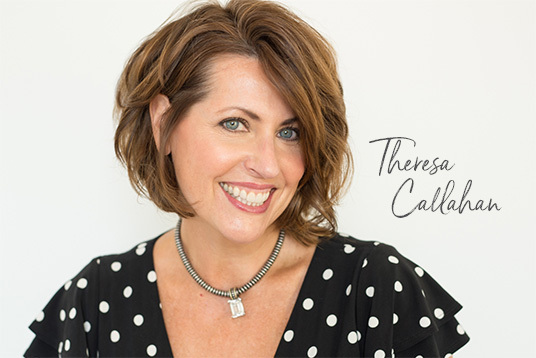 Sign up here for an introductory phone call, or send me an email at: tc@theresacallahan.com. I look forward to meeting you.